A lifelong traveller, Jonathan was feeling limited by his 40-hour-a-week job as an air traffic controller. “I never really got an opportunity to spend more than a couple of weeks away,” he says. So in 2011, Jonathan sold everything he owned and took an early retirement. Then he set out to find a place where he could indulge his lifelong passion for photography. And in the Laotian capital of Vientiane, a city of low costs and friendly locals, he has found just such a place. 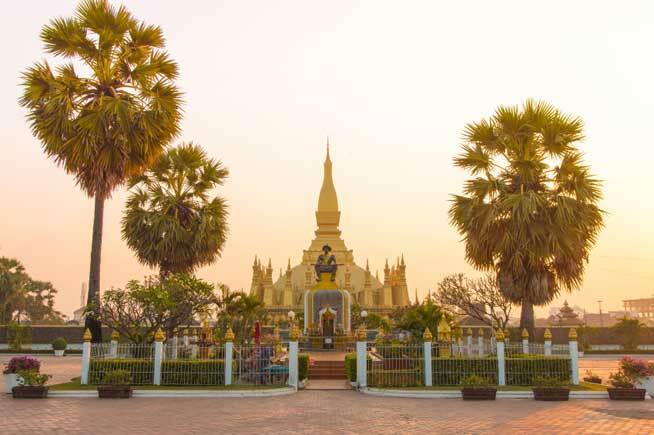 Laos’ sleepy capital city sits along the Mekong River. The lower cost of living, including a water bill of only $4 a month and a budget of $13 a month for talk and data on his iPhone, allows him to focus on what he enjoys. Jonathan decided to check out Vientiane as a home base when he heard that it was like Thailand 50 years ago. He and his partner Sarah Wilson, were living in Chiang Mai but looking for something a bit more exotic, where they could move her dog and cat easily. They tested Vientiane out for a month and fell in love with the people. Vientiane is in the north of Laos, directly across the Mekong River from Thailand. Golden Buddhist temples are interspersed amongst palm tree-lined drives and the wrought-iron gates and architectural touches of French colonialism. With a population of about 750,000, Vientiane is still far from bustling and its centre is quite walkable, with two main drags running parallel to the river and its accompanying river walk. The couple has found the expat community to be welcoming. Many of the expats here are French. They have some Lao friends, as well, and Jonathan finds the cultural differences to be fascinating. “Every day you find out amazing new facts,” he says. The couple recently landed their dream home on the Mekong, with a walled garden and sunset views. Their rent is $1,300 a month. However, if you’re willing to live less than 10 kilometres out of town in a Lao-style home, you can get some acreage and pay as little as $260 a month. Jonathan enjoys travelling around Asia inexpensively from the major hub of Bangkok. He heads across the border to Thailand and, after only an hour of travel, can get flights from a smaller airport into Bangkok for $19. From there, he can get just about anywhere. He’s travelled to Bali, Bhutan, Myanmar and Malaysia. Occasionally, he and Sarah head to Bangkok for the weekend to take advantage of its world-class shopping malls and movie theatres—though they can stay at home and see a newly-released film at the brand new theatre in Vientiane for about $3.20. For anyone else looking to embrace expat life, Jonathan says that you’ll never have all the answers before you leave. Sometimes in life, you just need to take that step. But the rewards of doing so are well worth it.